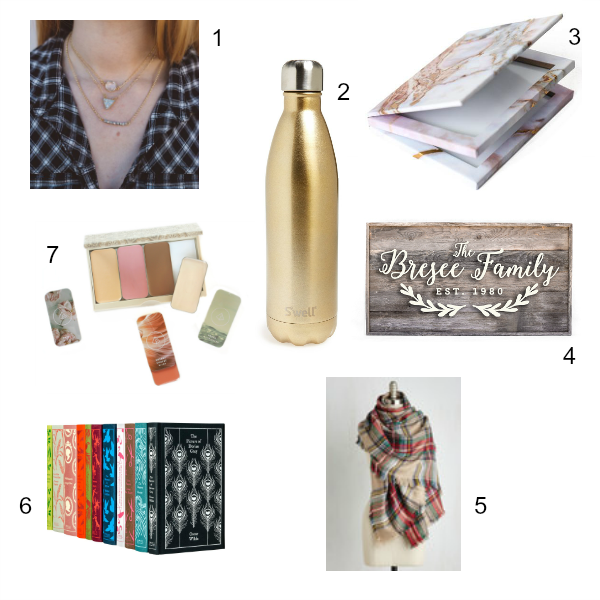 Our annual round up of fabulous gift ideas is something we look forward to all year long. Perfect suggestions for all kinds of personalities and budgets, right here. 1. A gorgeous necklace stack from The Shine Project is understated and oh so pretty, with so many options–even charms and mantra rings. I love the “Sky” and “Nykelle.” On trend and sentimental, and purchases help put underprivileged students through college by employing them. Doing good is always good. 2. This champagne colored water bottle is ever so much classier than the bulky plastic kind covered in logos. She’ll tote it in style to her next gym glass. Also, these stainless steel bottles keep the water chilled longer than the plastic kind. Adds a bit of glam to slaying those fitness goals. 3 + 7. For the gal obsessed with beauty, be it daughter, sister, mother, or friend, these custom palettes from Maskcara are perfection. The formulas are lovely, the colors luxurious, and everything you need for a gorgeous look is all in one pretty little compact, with shades you choose. 4. Handmade and meaningful is always a good choice. A custom wooden sign from Harper Grayce might showcase a family name, motto, or business. Several styles, all perfectly rustic and modern at the same time, at home in all kinds of settings. 5. A blanket scarf is chilly weather’s ultimate multitasking accessory. A necessity, even. All the color ways in this style from Modcloth are stunning, and let’s be honest, a pretty scarf can disguise a multitude of troubles. 6. For voracious readers who also love pretty things, these hardcover classics from Penguin are ideal. With all the greatest classic titles and beautifully designed covers, you won’t even need to gift wrap them.